Established with Puritan values Boston is a "City upon a hill". 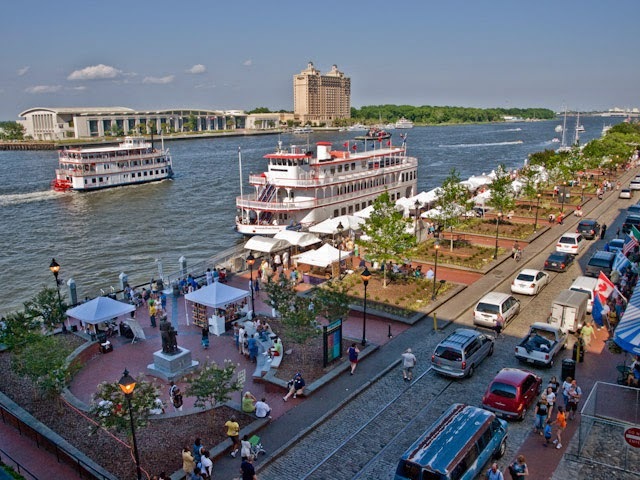 Savannah is a leading port city, established as a military buffer, settled first atop the high Savannah River bluff with a mission to protect the prized British colony in South Carolina from Spanish invasion from Florida. Now a Savannah resident, Boston native Janet McCrary of Wiley's Championship BBQ, points to how Savannah and Boston are unique, yet akin. The Savannah Historic District, a National Historic Landmark, was established November 13, 1966. The Juliette Gordon Low Birthplace, noted as the family home of the Girl Scouts founder, was the first National Historic Landmark in Savannah. Boston has five National Historic Landmark Districts in North Boston and South Boston, established in October 15, 1966. Warren Square, located on Habersham Street, between Bryan and Congress Streets in Savannah, was laid out in 1791 and named to honor Major-General Dr. Joseph Warren, a patriot and American Revolutionary War hero who was killed at the Battle of Bunker Hill (June 17, 1775). It was there that forces were ordered, “Don't fire until you see the whites of their eyes!" It was the British Sugar Act (1764) and the Stamp Act (1765) that spurred colonists to emerge into war against Britain. The unnegotiated taxes provoked The Liberty Boys in Savannah, who seized the British gunpowder bunker. They sent much of the powder to Boston, where it was used in the Boston Tea Party (December 16, 1773). Tidbit: In protest, coffee became the popular beverage in America’s colonies. The ‘sister city’ relationship between Savannah and Boston survived even the Civil War (1861-1865). Bostonians sent shiploads of provisions to Savannah, Georgia, shortly after the city surrendered to Union General Sherman in December 1864. Today the Boston Tea Party Ships & Museum prominently features full size sculptures among the cast. Among them are Savannah artist Susie Chisholm’s life-size bronze of Revolutionary War hero, Captain John Parker, The Minuteman, positioned in the foyer of the Minuteman Theater. Mrs. Chisholm’s art studio is located in Savannah City Market where she is sculpting her latest work -- General Nathanael Greene, who was second in command to General George Washington during the American Revolutionary War. Not established for religious freedoms as was Massachusetts, Savannah’s famous Town Plan, however, reserved Trust Lots for churches, public and government buildings. Today historic churches are prominent architecture, usually found on the east or west side of downtown Savannah squares (parks). The Boston, MA (BOS) to Savannah, GA (SAV) flights are approximately 2.5 hours via Jet Blue airlines. The estimated Boston to Savannah train ride via Amtrak’s Palmetto is approximately 11 hours. On the Greyhound bus Boston to Savannah is 22-to-25 hours. By car, drive time is estimated at 17+ hours. Zeigler House Inn - Summer Weekday & Weekend Getaway Specials -- Valid July 15 – August 28, 2014 stay, excluding holiday and special event dates. • Best available room at time of booking. • $169/night Monday-Thursday, plus tax. • Friday - Sunday is 15% off high season rates. • Complimentary in-suite breakfast, afternoon pastries, hot and cold beverages, plus parking are included. • Only good on new reservations booked after April 1, 2014 and before August 28, 2014, Call Toll Free USA 866-233-5307 or Local 912-233-5307. • Children under 12 years of age stay free. • Rates based on double occupancy - $30 each additional person per night. • Not available with group or existing reservations. • Excludes Holidays and special events. Green Palm Inn - A deal for solo travelers ... (with option to bring a friend!). A summer deal that's a "restful runaway all by yourself" package in Savannah. The Green Palm Inn's Savannah summer deal includes 2 nights lodging in the Sago Palm or Palmetto Palm for $350 including tax, NEW Wiley's Championship BBQ cook book, parking, breakfast, Wi-Fi, afternoon desserts, and pre-dinner wine and finger appetizers, plus more #LittleExtras -- personal concierge service and insider tips. Add a 2nd person for $20 per night. Valid for lodging June 18, 2014 through August 27, 2014. Telephone 912-447-8901 or Toll Free USA 888-606-9510; email GreenPalmInn(at)aol(dot)com. The 1895 Inn - "The award winning The 1895 Inn is having a special for the month of August 2014. All rooms are discounted to $150.00 per night plus tax (except the Renaissance Room which is discounted to $175.00 per night plus tax). For more information or to complete your reservation, simply give us a call on our toll-free number 866-900-1895 (or direct local telephone 912-231-8822) between 10 a.m. and 8 p.m. Eastern Time. Please mention "Romantic Inns of Savannah Summer Special." Catherine Ward House - Teachers Discount. Teachers, current and retired, to thank you for all you have done every day of the school year and beyond, we offer you the following summer vacation reward. 15% discount off any stay, Sunday-Thursday nights, during the months of June, July, and August 2014. Telephone local: (912) 234-8564, or Toll Free: (800) 327-4270.